Abstract: Migmatites with evidence for low pressure metamorphism and partial melting occur adjacent to the Alvand Plutonic Complex in the Hamedan region of Iran. They show stromatic, schollen, diktyonitic and massive structure. Sillimanite/andalusite/(kyanite)-garnet- and cordierite-K-feldspar-andalusite-spinel-bearing migmatites are the most common rock types. Some of the granitic intrusions contain xenocrysts which resemble the porphyroblasts of nearby migmatites (e.g. sillimanite, andalusite, cordierite and garnet). Although migmatitic rocks of the region are located near the granitic intrusions, the degree of partial melting is not related to intrusions and is irregular. It appears that partial melting and migmatization pre-date the intrusion of major granitic bodies in the region. Leucosomes in stromatic migmatites are commonly parallel to bedding planes and are mostly formed by metamorphic segregation and/or in situ partial melting (showing mafic selvedges, pinch and swell structures). The melt fraction and migmatite type depend on the chemical composition of parent rocks and the distribution of high strain zones. The formation of thin leucosomes in the stromatic migmatites was controlled by short-range melt movement along the grain boundaries. Melt-rich layers are constrained by pre-existing compositional layering and foliation. Peak metamorphic conditions of ~650 °C and ~300 MPa are consistent with the observed mineral assemblages and the presence of melt in the investigated migmatites. Abstract: The Odivelas Limestone constitutes one of the few records of Middle Devonian sedimentation in the western Ossa-Morena Zone. Although deformed and metamorphosed the limestones have an abundant fossil content which allows their positioning as late Eifelian/early Givetian in age and to relate the reef fauna with the typical Rhenish facies for the same time period. Magnetic susceptibility analysis was attempted and is in agreement with the biostratigraphy, but the limited extent of sections and the metamorphism precludes firm correlations. 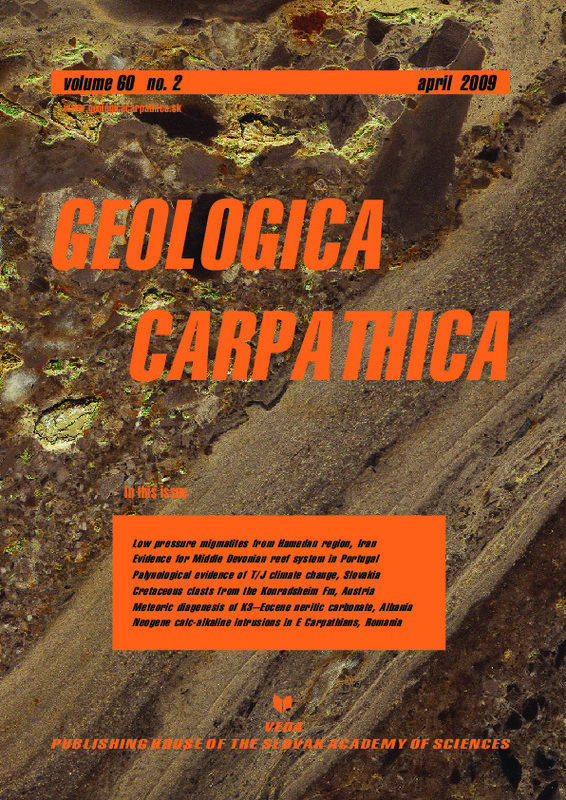 The field evidence, petrographic and geochemical analysis point to a close paleogeographical relation and dependence of the reef system on volcanic structures which are included in the Beja Igneous Complex. The age of part of the volcanic and sub-volcanic suite of this complex is thus constrained. Abstract: The palynology of the Triassic/Jurassic boundary interval of the Furkaska section (Tatra Mts, Slovakia) was studied with respect to a major climatic change during that period. The palynofacies is dominated by terrestrial particles, indicating a shallow marine depositional environment. The palynomorphs are fairly well-preserved and the assemblage shows characteristic changes within the Triassic/Jurassic boundary interval: the lower part of the section is characterized by high abundance of Ricciisporites tuberculatus. The sudden increase in abundance of trilete spores, the decrease in the abundance of Ovalipollis spp., the last appearance of Alisporites minimus and Corollina spp., and the first appearance of Concavisporites rhaetoliassicus, Cyatidites australis, Callialasporites dampieri, Pinuspollenites minimus, Platysaccus spp. and Zebrasporites fimbriatus are striking features for a subdivision of two palynomorph assemblages. The detected spore shift is interpreted to display a sudden increase in humidity most probably caused by the volcanic activity of the Central Atlantic Magmatic Province (CAMP) associated with the onset of rifting of Pangaea during early Mesozoic times. Abstract: Investigations were carried out on foraminiferids and radiolaria from redeposited clasts within the conglomerates of the Konradsheim Formation (Gresten Klippen Zone) in the area of the Pöchlau hill, east of Maria Neustift. These shales and marls are of Middle to Late Jurassic and Early Cretaceous age. In the latter clasts, foraminiferal assemblages with Tritaxia ex gr. gaultina as well as radiolaria species Angulobracchia portmanni Baumgartner, Dictyomitra communis (Squinabol), Hiscocapsa asseni (Tan), Pseudodictyomitra lodogaensis Pessagno, Pseudoeucyrtis hanni (Tan), Rhopalosyringium fossile (Squinabol) were found. In one block from the uppermost part of the sequence there is an assemblage with Caudammina (H) gigantea, Rotalipora appenninica and Globotruncana bulloides. However, the brecciated character of this block and occurrence near a fault suggest that it was probably wedged into the conglomerates of the Konradsheim Formation during tectonic movements. In pelitic siliceous limestones below the Konradsheim Limestone radiolarian assemblages of Middle Callovian to Early Tithonian age were found. They enable correlation with the Scheibbsbach Formation. In a marly sequence, above the conglomeratic limestone, the foraminiferal assemblages contain taxa from mid-Cretaceous up to Paleocene. The present biostratigraphic investigation confirmed the previous stratigraphic assignments and imply clearly that the sedimentation of deposits similar to the Konradsheim Formation also occurred at the end of the Early Cretaceous and deposition of conglomeratic limestones within the Gresten Klippen Zone, and especially within the Konradsheim Formation, was repeated several times during the Late Jurassic and Early Cretaceous. Abstract: In the central part of the Kruja Platform (Albania) located in the Apulian passive margin, geochemical analyses (calcimetry, Sr, REE and isotopic, δ13C and δ18O) coupled with sedimentological and sequence stratigraphic study were carried out on Upper Cretaceous (CsB4, CsB5, CsB6 Biozones) and Paleocene to Middle Eocene shallow-water carbonates that crop out in the Kruje-Dajt massif (L’Escalier section) and Makareshi massif (La Route section). The lower values in Sr contents, the homogeneous δ18O values in both sections and the covariance between δ 13C and δ18O values (La Route section) are attributed to diagenesis influence by a meteoric water-buffer system, supported by petrographic observations. Moreover, a new exposure surface during the Late Cretaceous time (between CsB5 and CsB6 Biozones) may be proposed according to the low or negative excursions of Sr values, the negative excursions of isotopic values in both sections and a positive peak of normalized REE values (La Route section). These variations correlate with the geochemical signal reported by the decreasing strontium isotope values of rudist shells in the Island of Brac carbonate platform (Apulia domain) during the late Middle Campanian (77.3 Ma). Also, this continental exposure is consistent with the global sea-level fall reported from the Boreal Realm, North Atlantic, and the southern Tethyan margin. This geochemical evidence is a complementary tool for the sedimentological analysis and suggests a maximum regression (a sea-level fall) at the transition between the CsB5 and CsB6 Biozones. The high values of Sr content in Middle Eocene carbonates (L’Escalier section) reflect changes in depositional environment from restricted to open marine conditions. REE values increase through transgressive systems tract, characterized by small increase of detrital input. However, anomalies of certain values in both sections suggest disturbances linked either to the changes in clay input and to diagenetic modifications. Peaks in dolomite content are linked with regressive episodes or tendencies, and dolomitic facies, as indicated by intertidal-supratidal depositional environments. Abstract: The Poiana Botizei–Tibles–Toroiaga–Rodna–Bârgâu intrusive area (PBTTRB), northwest Romania, known as the “Subvolcanic Zone”, is located between the Gutâi (NW) and Câlimani (SE) volcanic massifs. It consists of rocks displaying a wide range of compositions and textures: equigranular or porphyritic with holocrystalline groundmass (gabbro-diorites, diorites, monzodiorites and granodiorites), and/or porphyritic with fine holocrystalline or glassy-cryptocrystalline groundmass, similar with effusive rocks: basalts, basaltic andesites, andesites, dacites and rhyolites. The time-span of intrusive rocks emplacement is similar with the nearest calc-alkaline volcanic rocks from Gutâi (NW) and Câlimani (SE) massifs. They are represented by stocks, laccoliths, dykes and sills typical for an upper crustal intrusive environment. In the absence of biostratigraphic evidence, a comprehensive K-Ar study of intrusive rocks using whole rock samples, groundmass and monomineral fractions (biotite, hornblende) has been carried out in order to understand the magmatic evolution of the area. The oldest K-Ar ages recorded in the analysed rocks are close to 11.5 Ma and magmatism continued to develop until about 8.0 Ma. The inception of intrusion emplacement in the PBTTRB is coeval with intrusive activity spatially related to volcanism within the neighbouring Gutâi and Câlimani massifs. However, its culmination at ca. 8 Ma ago is younger than the interruption of this activity at ca. 9.2 Ma in Gutâi and Câlimani Mts where intrusive activity resumed for ca. 1 Myr. These circumstances strongly suggest that the geodynamic evolution of the area controlled the development of both volcanic and intrusive activity and their reciprocal relationships. The overall geological data suggest that in the PBTTRB intra-lithospheric transpressional-transtensional tectonic processes controlled the generation and emplacement of intrusive bodies between ca. 12–8 Ma.